How to find the best pet portraits artists? How to find pet portraits near me—the first place to turn is the Internet. The first place to start your search is with Google. In the Google search box, type in something like this “pet artist (your city)(your state)” and hit enter. Google should bring up a series of names, along with a map showing where each artist is located. If Google doesn’t bring up the list + map, just search through the entries below the search box and visit each artist’s website. Read carefully through each site before choosing one or more artists to contact. 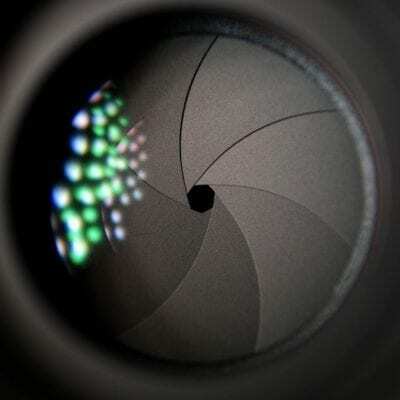 Be sure to read through all the details on the services provided, the costs and what types of files are used, and if the artist offers a guarantee. Another way to find pet portraits near me is to ask family and friends, work colleagues, etc. for referrals. 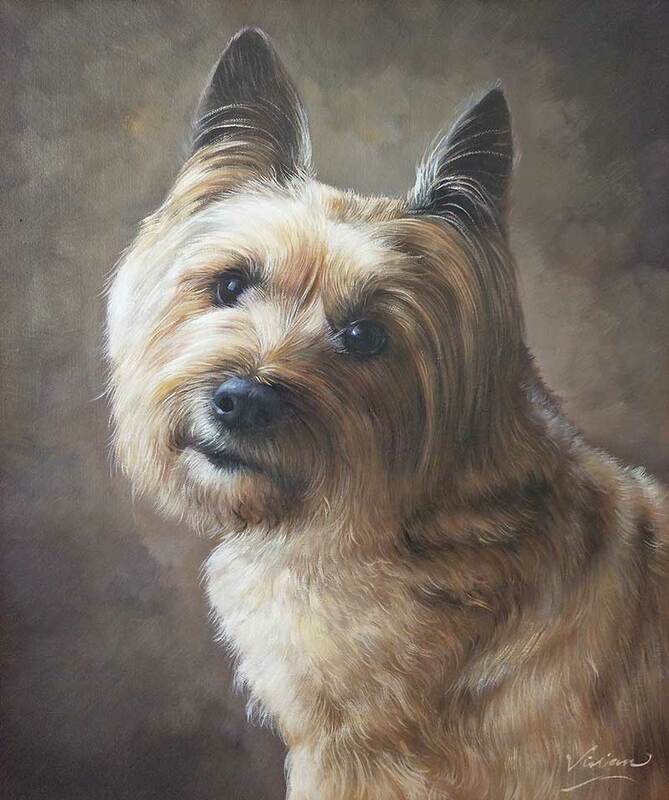 Ask if they’ve had portraits done of their pet(s), what artist they used and if they would recommend that artist based on the finished portrait and the artist’s customer service. Paintings are a popular option when it comes to pet portraits. You can choose to have your pet’s portrait done in oil paint, watercolors, or even acrylic paints. Artists may offer their services through their own website or Etsy shop, or may even work for a company that sells pet portraits of all types. ShanaPatry on Etsy: Shanapatry sells her services on the Etsy shopping platform, specializing in “a custom minimalist watercolor illustration of your dog, cat, horse or any other animal.” Here, you send Shana a digital photo of your pet and she paints the portrait in bold, lovely watercolors. 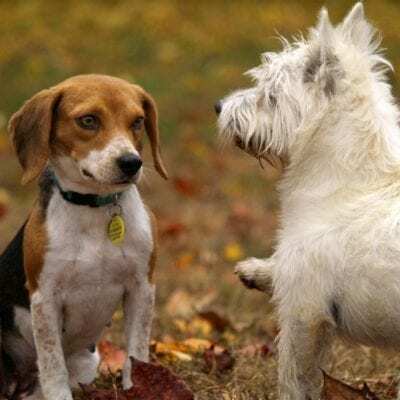 Paint Your Life: is a website offering portrait services not only for people, but for pets, too. Here, you can choose the theme (pet portrait, people and pet, etc. ), the style (watercolor, acrylic, oil, etc. ), and you can even choose the artist. It’s easy to view each artist’s portfolio—just choose a name from the dropdown list and you’ll be taken to their portfolio page. This way, you can choose the artist based on their style, etc. At Paint Your Life, you can also choose the portrait’s size and even add in special requests and comments to help the artist capture your pet’s likeness. You’ll have a beautiful, unique custom pet portrait canvas painting to enjoy for years to come! As you can see, there are many ways to find artists/sites who can work on your pet’s precious portrait. The Internet has a wide variety of options when it comes to custom pet portraits paintings. Not only can you get a custom pet portrait canvas with oil and acrylic paints, but a pet portrait can also be done in other mediums, such as embroidery or even a wood portrait! Let’s take a look at some examples! 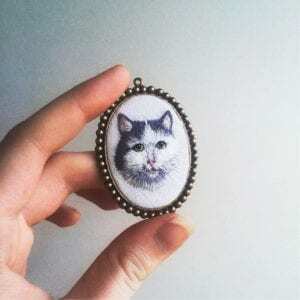 EiraTeufel on Etsy: features intricate embroidered pet portraits on a pendant or as a bracelet charm. She even offers embroidered pet portraits on brooches, earrings and cufflinks. What a unique way to keep your pet with you all the time! Not only can you include your pet in the image, but you can also add flowers or letters to the image. Eira also allows you to choose the frame type for your jewelry pet portrait. This artist is from Saint Petersburg, Russia and loves making embroidery miniatures. 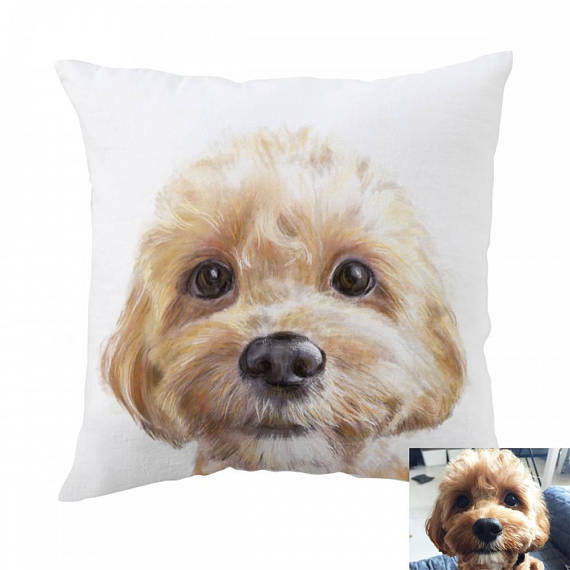 Crystal Ho on Etsy: offers pet portraits on custom pillow tops. 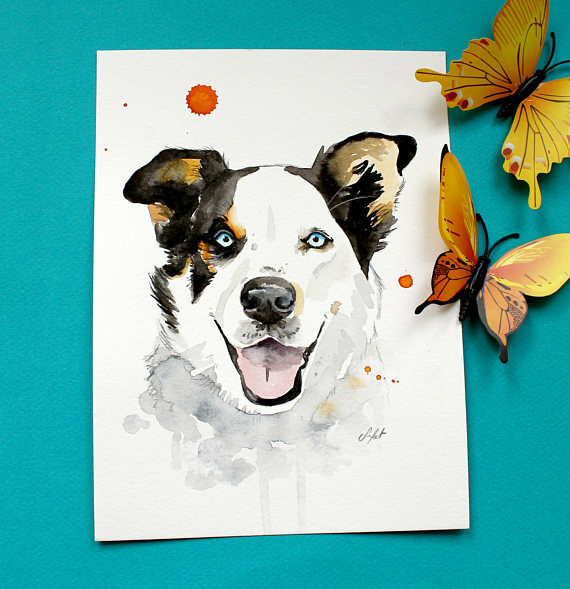 She paints a custom portrait, capturing the personality of your pet friend. The pillow top (doesn’t include filling) is made in their studio and is individually printed and sewn by hand. You just send photos of your pet—make sure they’re high resolution and detailed, as these create the best images. TripleStudio will send you updates during the painting process, which allows you to make changes as the portrait is painted. You’ll receive a final digital image, so you can proof the image before it’s printed on a pillow cover and sent to you. Starlight Studios on Etsy: sells a custom animal portrait on reclaimed wood. 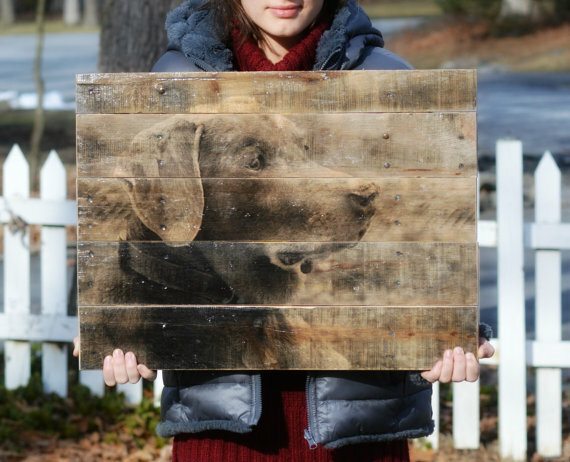 This way, you’re not only buying a beautiful pet portrait, but you’re also saving the environment with the reclaimed wood. Starlight Studios transfers your pet’s image directly onto the reclaimed wood (from a pallet). All imperfections will remain in the piece: this means the natural wood grain, nail holes and other imperfections will clearly show. The wooden photograph is then sealed and comes with the necessary hardware to hang your pet’s portrait after you receive it. Again, you’ll need to select the highest quality photo of your pet, with 300 dpi (dots per inch) or higher resolution to create the large wooden photo. You can have a custom animal portrait made in almost any medium! Not only that, but such pet portraits make a wonderful gift for anyone—family, friends, colleagues—who love their pets and/or who have lost a beloved pet. For cat lovers, you can even find artists who specialize in creating beautiful custom portraits of cats. Our feline friends can be a challenge to paint with their many moods and expressions. Cats also do “cat things,” making a one-of-a-kind portrait a true piece of art. If you’d like to find an artist who specializes in cats, search for one who obviously loves cats. Carefully review the artist’s portfolio and look for the way they’ve captured the cats’ portraits. You’ll know a cat-lover when you see one! A custom cat portrait also makes a great gift for the cat lover(s) in your life! 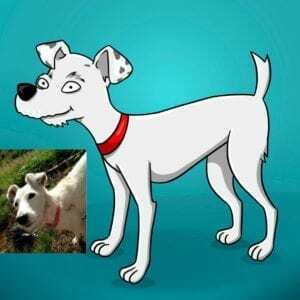 Andrew: does cartoon pet portraits! Just send him a digital photo of your pet, and in 3-4 business days he’ll send you a digital cartoon image of your pet’s portrait! Deaandbean: creates a beautiful illustration of your pet! Each portrait is unique. This artist creates the illustration and in 5 business days the final print will be delivered to you. You can even ask for a printable version, which comes as a PDF file emailed to you. 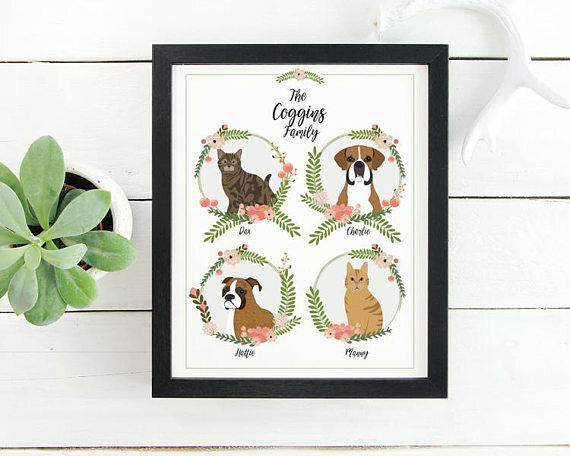 Then you can print out your pet’s illustrated portrait at home! Don’t forget that you can also find artists who are willing to create a portrait of you and your pet together! This is another option that makes a wonderful keepsake you’ll treasure for years to come. Here, again, you’ll find many options available—you can have your portrait done in any style, medium, etc. You can find artists on Esty and other sites who will help you create a distinctive portrait of you and your pet. 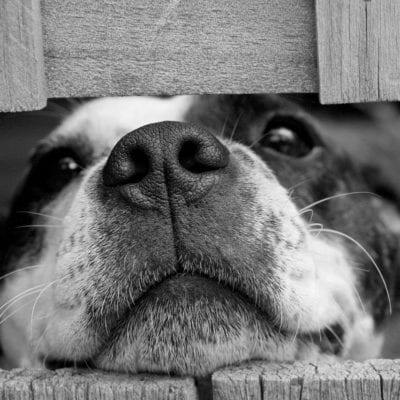 The sky’s the limit when it comes to getting a portrait of your pet made. We’ve covered several different options available from various artists online—from illustrations and cartoons, to oil paintings and wood pallet creations. A one-of-a-kind pet portrait is fast and easy these days—just turn to the Internet and click! Let your imagination run and find the best artist to create a unique piece of art from a photo of your precious pet. Wow! All these talk about painting pets just makes me want to go get one for my pet. I love having a picture of my pet to stare at because I don’t always travel with her so all I have are photos on my phone. Maybe I could get a jewelry portrait of her. Maybe a bracelet. That way, I’ll always see her whenever I look at my wrist even while driving. 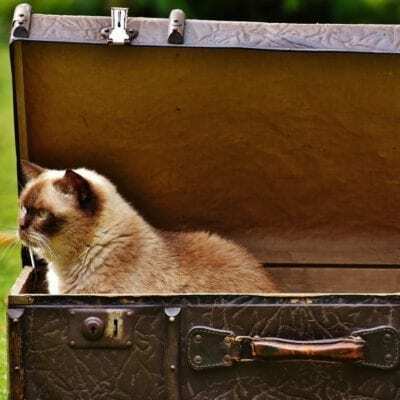 I’m off to esty! I hope to get a very good job done. I have an oil painting of my cat and I totally love it. The artist keeps cats as pets and so when I asked him for a portrait of my cat, it wasn’t a big deal for him. Matthew already knew the features of cats and how to capture their expression the right way making it look real. I got my dog’s painting on my pillow and one of my shirts. I love the relaxed feeling I get when I place my head on the pillow. And whenever I go out for a walk with him, I always wear the shirt. Most times when we stop to sit, he stares at the painting on the shirt like he knows it’s him! Fiverr is also a great place to find amazing artists to paint your pet in any medium. I got an acrylic painting of my rabbit at a cheap rate and I was sent the pdf file for print. I also got a watercolor portrait for my friend who has always wanted to get a portrait of her cats and placed beside her bed. I’ve got paintings of all the pets I’ve ever had, both living and dead. My house looks like an art museum for pet portrait collection It gives a very nice feeling of responsibility and keeps them fresh in my mind. My artist is in Etsy and she has been doing a great job of capturing the correct facial expression of each pet just the way I like it. You’ll appreciate these paintings, especially made on jewelry if you are always on the go or lost a pet.